Ms. Halsey-Storch has a general practice with a concentration in all aspects of matrimonial and family law including divorce, child custody, support and family offense proceedings, as well as the preparation and negotiation of pre-nuptial and post-nuptial agreements. Ms. Halsey-Storch’s other areas of practice include real estate transactions, land use and zoning matters, and civil and estate litigation. Ms. Halsey-Storch is dedicated to providing pro-bono representation, and works with, among other organizations, the Retreat, Inc., a not-for-profit domestic violence center in East Hampton, providing representation to victims of domestic violence in matrimonial and family law matters. 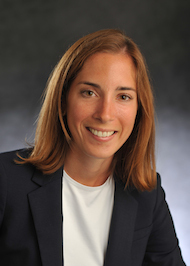 Ms. Halsey-Storch received her Bachelor of Arts from the College of Wooster and her Juris Doctor degree from Syracuse University College of Law. While attending law school, Ms. Halsey-Storch was a participant in the Children’s Rights and Family Law Clinic and a member of the Impunity Watch Law Journal. Ms. Halsey-Storch is admitted to practice law in the State of New York. Retreat, Inc., representation of victims of domestic violence in matrimonial and family law matters. Town of Southampton Community Housing and Development Corp., representation of purchasers of affordable housing in Southampton.